Sometimes by accident and sometimes on purpose, humans have transported plants and animals to new habitats around the world. Arriving in ever-increasing numbers to American soil, recent invaders have competed with, preyed on, hybridized with, and carried diseases to native species, transforming our ecosystems and creating anxiety among environmentalists and the general public. But is American anxiety over this crisis of ecological identity a recent phenomenon? 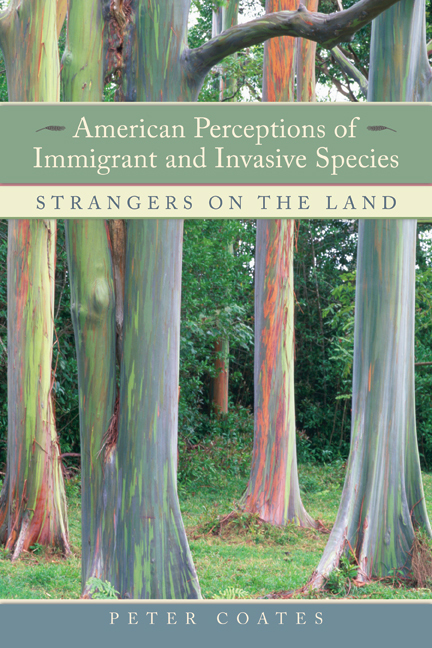 Charting shifting attitudes to alien species since the 1850s, Peter Coates brings to light the rich cultural and historical aspects of this story by situating the history of immigrant flora and fauna within the wider context of human immigration. Through an illuminating series of particular invasions, including the English sparrow and the eucalyptus tree, what he finds is that we have always perceived plants and animals in relation to ourselves and the polities to which we belong. Setting the saga of human relations with the environment in the broad context of scientific, social, and cultural history, this thought-provoking book demonstrates how profoundly notions of nationality and debates over race and immigration have shaped American understandings of the natural world. Peter Coates is Reader in American and Environmental History in the Department of Historical Studies at the University of Bristol, UK. Among his books is Nature: Western Attitudes Since Ancient Times (UC Press).